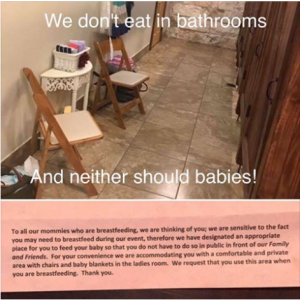 NORTH TEXAS (WBAP/KLIF News) – A North Texas family is facing backlash because of a wedding invitation it sent with a note asking mothers to nurse their children in the bathroom. Deron Crenshaw is the mother of the bride and said the woman who complained on social media, which made the wedding go viral, didn’t even bring her baby to the wedding which took place September 17th. “This is a private party, private event, private wedding in which she was invited to and she has enough audacity to use our wedding platform as being an advocate for breast feeding. That is disrespectful,” she said. Advocates of breastfeeding in public said it’s unsanitary to force a woman to breastfeed in a bathroom. Crenshaw said the woman who had the issue with the stipulation could have talked to her about it. “Ultimately, she doesn’t want to do that she wants the light to shine on her as trying to do something you know for the breastfeeding mommy,” she said. Crenshaw said she and her daughter spent a lot of time and money trying to find various ways to accommodate their guests. “We’ve planned it for 15 months. I’ve spent $30,000 on this wedding. You try to think of every avenue to make people happy but ultimately it’s the bride and the groom’s day,” she said. The venue was equipped with other places for breastfeeding moms to go to if needed. Here was the post that sparked the controversy. Copyright 2017. WBAP/KLIF News. All Rights Reserved.